Hello friends of our beloved site, here where we always bring news and everything that has new and beautiful in our world of crafts. 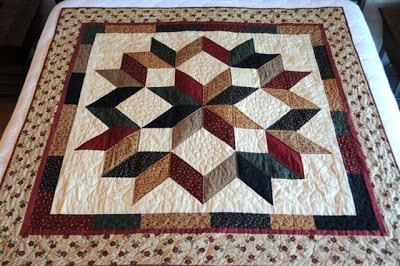 Today we have a novelty for you that is the one practice of crafts that never brought to you here in the site, the practice is called quilt, patchwork as you know by name. This type of craftsmanship is very much practiced and also has many exhibitions of works done so with crochet work that has its fairs and exhibitions but the quilt has many more exhibitions and even championships and the best jobs receive medals is also very cool. Explaining a bit of the world of patchwork / quilt, this work is done with fabrics. pieces of fabric of different shapes that are coming together, sewing. Contains 3 parts that is the top, the liner and bottom, have jobs that use more linings and others less, this goes much of their opinion and preference. What I'm sure is that you will also like to practice this type of work, it is very gratifying in the end as well. Today's quilt pattern is the one I left in the photo below, if you were interested then let's learn. The pattern today as you know is different, it's about patchwork. Above I left a photo of this pattern to see how it is, is a pattern well known by the name of Carpenter Star Quilt. This pattern consists of a type of stars and tips that will form the pattern. is a pattern of intermediate level but clear, nothing interferes with a person with level of experience of beginner to be able to make this incredible pattern, only to have dedication and discipline. As I always say the practice of each pattern and each stitch, point takes the best skill and perfection, knowledge is never too much. Just like crochet the practice of patchwork craftsmanship also has its benefits for us, also helping in memory, motor coordination and also in esteem and satisfaction, being practiced at all ages. 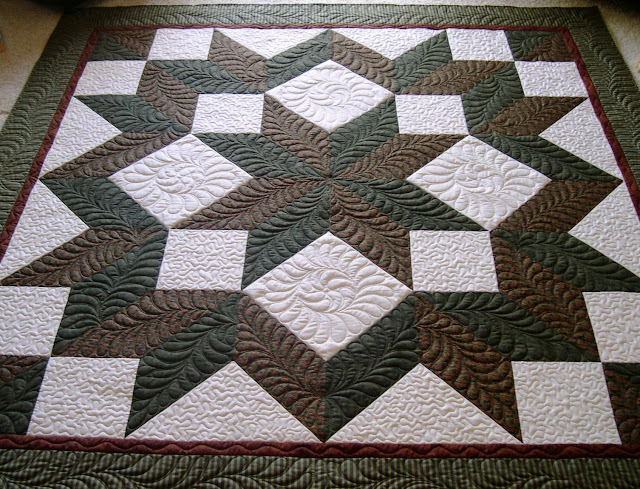 This pattern has a union of triangles that will shape and form this gorgeous quilt pattern. You can use a lovely quilt or you can use it as a wall decoration. You make the union of the fabrics so united they form the beautiful and original pattern, being able to change the colors however you want, being able to use plain colors or printed fabrics, being able to choose as preferred. There are thousands of quilt patterns that can be made only with little material, pieces of fabric of your choice, needles and yarn or can also do with a sewing machine. People prefer with sewing machine because of the uniformity of the seam, getting more sure and uniform different from hand sewing that can gets different one point from the other so making a difference in their work by appearing more on quilts that is straight and on cushions of the disguise. If you liked this novelty here of the site and liked this pattern, do not waste time and also do just storing fabrics in each other and having beautiful works. Below I leave the pattern as a pdf and also the video tutorial just after the photo of how it will look like this pattern in the final result. Have a great week and let's practice.